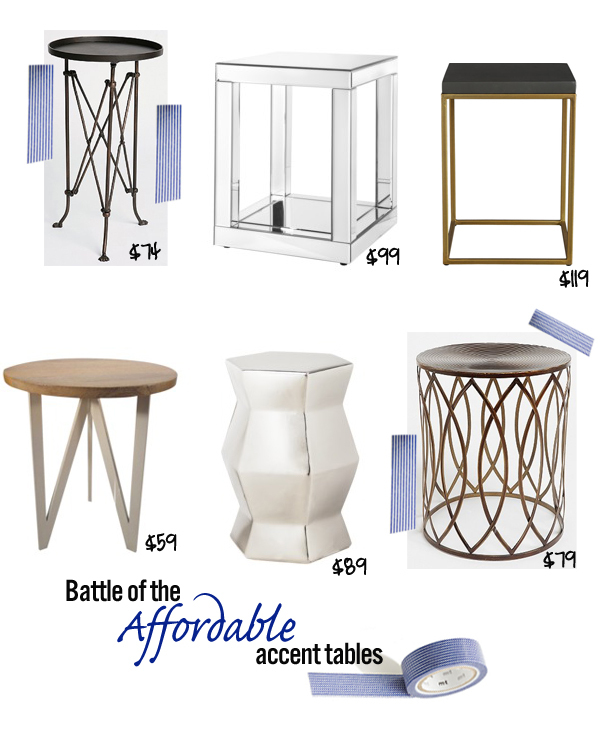 I have come across some very handsome accent tables combined with very nice price tags. Of course, I needed to share them with you. A good accent table can be such a problem-solver and it can add plenty of personality as well. Which is your favorite? Any other ones I should know about? So I am in LOVE with #3!! I love the one from Target (no.4)! They always have the cutest options and even better they are affordable! Totally admiring no. 2 cause I'm such a sucker for mirrored accent pieces. Thanks for sharing these! Target has some of the best budget accent tables out there. But I've also scored some amazing ones at overstock.com and recently at Joss and Main. West Elm too, especially when they're on sale. This is such a great roundup. I'm actually in the market for a few new tables, so thanks for this! Ahhh I am pretty sure I need all these! As always a perfect round up! xoxox! Loving the Zemi stool from CB2. Yowsa. I'd take any of them! Love that Target is so chic now. $59?! I love 3 and 6.. Send them on over please! Love the mirrored table! Maybe one of these days maybe I'll be motivated enough to get a new couch and will need a new table as well! I share Alison's choice:#6. Love the design! You've found some treasures! That's great that there are such affordable AND good-looking options out there -- thanks for sharing them! I have a total thing with mirrored tables lately. My big hold up has been that they're so expensive...this one is right up my alley! Great find. Great finds! Love them all! Wow, you found an amazing roundup for great prices. I have loved #1 forever, but now I think I would want #3. What great finds for such affordable prices - love the chrome table from Target!! these are great! i love that cb2 one. i've been looking for some end table, so this post was really helpful to see what's out there!